I went to SF with Paul this last weekend for a romantic getaway kinda thing. 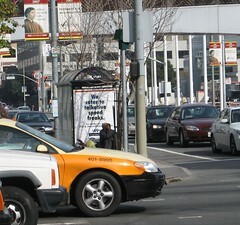 I think this photo pretty much exemplifies my memories of living in SF. note the advertisement. now note the dude twitching in front of it. Nice seeing you yesterday! We need to get back in the habit of movie nights and dinner.